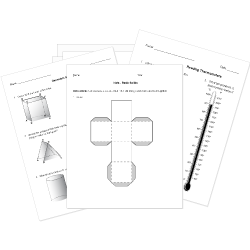 You can create printable tests and worksheets from these Grade 9 Angles questions! Select one or more questions using the checkboxes above each question. Then click the add selected questions to a test button before moving to another page. To divide a figure into two congruent parts. An angle bisector is a line that cuts an angle into at least two parts. Angles that have the same measure and are the same size. When lines intersect to form a right angle. Angles MRQ and RPN are alternate interior angles of two parallel lines cut by a transversal. If angle MRQ = 5x + 7 and angle RPN = 7x - 21, what is the value for angle MRQ? In triangle ABC, angle A = 50 degrees and angle C = 50 degrees. What can we tell about this triangle? What is the interior angle measure of a regular pentagon? In the triangle, angle A is 3 times as big as angle B, which is 2 times as big as angle C. What is the value of of angle C? What is the included angle of [math]bar (AD)[/math] and [math]bar (CD)[/math]? Which is a reflex angle? If you start at 0° and make 2 quarter turns, how many degrees will you have turned? If angle A = 71 degrees, find the measures of angles B, C, and D of parallelogram ABCD. If angle A = 62 degrees, find the measures of angles B, C, and D of parallelogram ABCD. If [math]angleA [/math] and [math]angleB[/math] are supplementary and [math]angleA=3x+12[/math] and [math]angleB=2x-22[/math], find the measurement of both angles. Angles A and B are vertical angles. If angle A = 2x - 5 degrees and angle B = x + 30 degrees, what is the value of x?